Scipio, that’s pretty weird. Even for you. Hey guys! Things are getting crazy over here, because I’m preparing for Geek Prom, the San Diego Comic Con. I’ll be at table E10 with Dirk Tiede of Paradigm Shift, From Preview Night straight through ’til Sunday, and I’ll be bringing along patches and books to sell! (No shirts, sadly. I just don’t have the room!) I don’t have many plans, other than one webcomic artist sushi date and hoping Worst Cartoons Ever has a showing this year, so c’mon by and say hi! Speaking of patches, though… Guess what just showed up in the shop? The Sincerist patches arrived today! And holy crap, you guys. Holy crap. Click the image to get your own. I’ll be takin’ the whole run with me to SDCC, and given the nature of that show, I can’t promise I’ll have any left for online orders afterward! And remember, I’m Ustreaming tonight. follow my big dumb Twitter for the link and announcement. Patches So Good but Scippio … Oh. OH. Ouch. *sigh* I know so many well-meaning people (many geeks) who think that their point, their story is so important that they just deliver it without taking the time to process how the other person is reacting as they go. Just like Scip’s doing right here. Oh God. Oh my god. PLEASE tell me you will someday get another pack of those patches, because I’d kill for one but cannot order anything online right now. ARGH. I don’t like the safety pin: it’s not a safety pin. Iconic pictures aren’t lies, the heart isn’t a heart, and that’s not a problem. But Sincerists were depicted with actual safety pins. 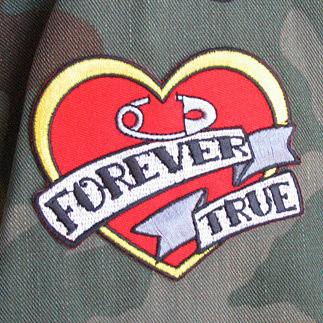 I don’t think truth culture would have any problem with an iron-on patch, and you could always choose to use a safety pin, all fine. But with THIS patch ironed on, the depiction suggests a patch that is pinned with a safety pin but IT IS NOT. Oh, Scip. You belong in an Institute of Terminally Well-Meaning People. You could always just blow everyone’s mind and pin it on with a safety pin anyhow! I’ll see you there! Hopefully you’ll bring some of your books so I can buy ’em, aye? I just finished the Archive. I decided to sew on my iron on patch. I don’t feel like buying an iron. Don’t forget, Spike…new Clutch out TODAY! I love that last panel! Man, that poor little bugger just keeps looking more and more terrified.